High Court challenge follows EE complaint over alleged spectrum restrictions, as O2 and BT apparently team up ahead of auction. The UK's 5G mobile spectrum auction could be about to be hit by significant legal action following a complaint from EE. The mobile network, which is owned by BT, is set to file an official challenge to a High Court ruling being sought by rival Three concerning the exact split of the upcoming auction. EE is also submitting a Letter Before Action notice of intent to Ofcom today, but says it has no desire to delay or block the auction. 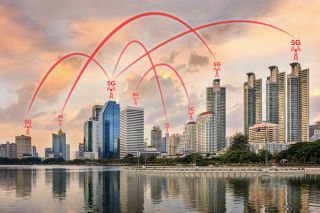 The company is only able to bid for a slice of one of the two frequency bands available, having been excluded from bidding for the 2.3Ghz band auction, but not from the 3.4Ghz band, which is expected to form the backbone for 5G networks. The auctions could take place within the next few weeks, legal battles notwithstanding. The debate stems from a complaint by Three, which believes that Vodafone, BT and O2 are all able to gain too much of the available mobile spectrum, hindering competition and leading to consumers missing out. Last month, Ofcom ruled that any one company is only able to bid for 37 per cent of the available spectrum, but Three wants this amount to be reduced to encourage competition. Combined with parent company BT, EE owns a significant share of spectrum, meaning it is in theory better placed to accelerate the development of next-generation 5G networks, which are expected to be activated by 2020. In a possible extra complication, O2 has said it objected to EE's challenge, with the company's chief executive Mark Evans saying that such action will, "inevitably case delays to the auction" and lead to damaging wider economic effects. EE has rejected this claim, however, noting its acceptance that it is excluded from one part of the bidding, and saying that its action could be carried out alongside Three's challenge without any extra delays.